more about the reindeer and work within reindeer herding. drivers or you just take a peaceful ride. be the culmination of the tour, before we return back to Jukkasjärvi. PRICE: euro 210.- per person. Euro 105.- per child (3-12 yrs); <3 yrs for free. DAILY TOUR: 8 Dec 2015 – 12 April 2016. No departure 24 Dec.
MEETING POINT: 13:30 at Nutti Sámi Siida’s Yard, Marknadsvägen 84 in Jukkasjärvi. TRANSFER: 13:00 pick-up from hotel/tourist information in Kiruna. 17:30 return from Jukkasjärvi to hotel/tourist information in Kiruna. TRANSFER: 08:15 pick-up from hotel/tourist information in Kiruna. 12:30 return from Jukkasjärvi to hotel/tourist information in Kiruna. All transfers have to be pre-ordered at time of booking, no extra charge. GROUP SIZE: Min 2 persons. MEALS: Smoked reindeer meat fried, and with flat bread, coffee/tea included. Vegetarian, gluten and lactose free diet must be pre-ordered. INCLUDED: Thermo overall, boots, mittens and hat. General conditions for booking as attachment. We look forward for your booking. If you want a special arrangement only for your group let me know, so we can give you an offer for that. Lodge camp where you will have your first encounter with the reindeer. 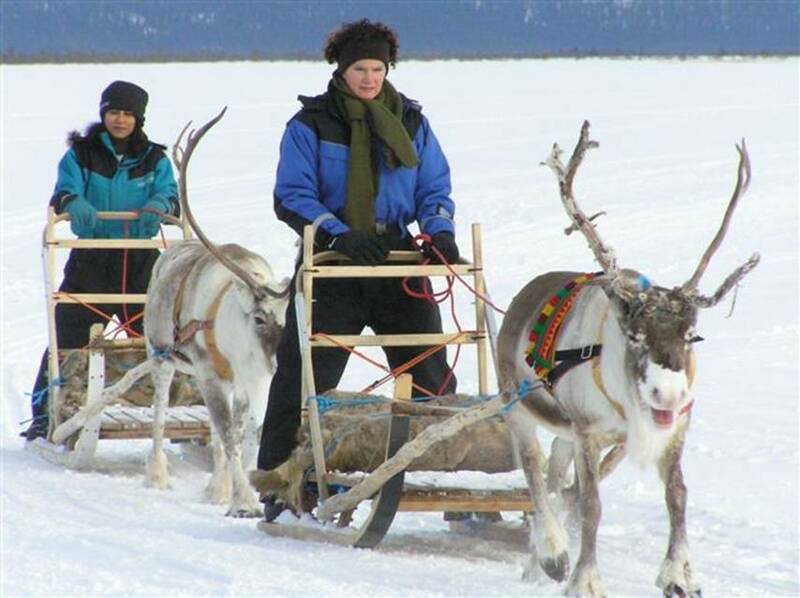 way of winter transportation in Sápmi. Take part in this old Sámi knowledge in a very practical way. herder lunch, smoked reindeer meat fried over the fire together with flat bread served in a Sámi lávvutent. You bid farewell to your new travel companion and we return towards Jukkasjärvi village. DAILY TOUR: 7 Jan – 12 April 2016. MEETING POINT: 8:30 at Nutti Sámi Siida’s Yard, Marknadsvägen 84 in Jukkasjärvi. TRANSFERS: 8:15 pick-up from hotel/tourist information in Kiruna. 13:30 return from Jukkasjärvi to hotel/tourist information in Kiruna. GROUP SIZE: Min 2 persons, max 8 persons per departure. MEALS: Lunch (smoked reindeer meat with flat bread, coffee/tea) included. Vegetarian, gluten free and lactose free diet must be pre-ordered. INCLUDED: Thermo overall, warm boots, mittens and hat. TOUR CONDITIONS: Min age for the tour 8 yrs. Min age to drive own sled 16 yrs. Children sit in a parent’s sled. General good level of health and fitness required.